A Northern Harrier flies low over the grasslands with a flock of Red-winged Blackbirds following it. Commonly mobbed by blackbirds, sparrows, starlings, swallows, kestrels, Short-eared Owls, Sharp-shinned Hawks, and other birds, the raptor decides the annoying harassers are too swift and maneuverable to put out the effort of trying to catch one. What It Is, and Why Do Mobbed Birds Put Up With It. Is it a hawk? Is it an owl? Short-eared Owls and Northern Harriers often share hunting and nesting territories, competing and even fighting over prey. Sometimes they will even steal from each other, a behavior known as kleptoparasitism. For more information on kleptoparasites check out my blog Kleptoparasites: Pirates in the World of Birds. Northern Harriers are the most owl-like of all hawks. 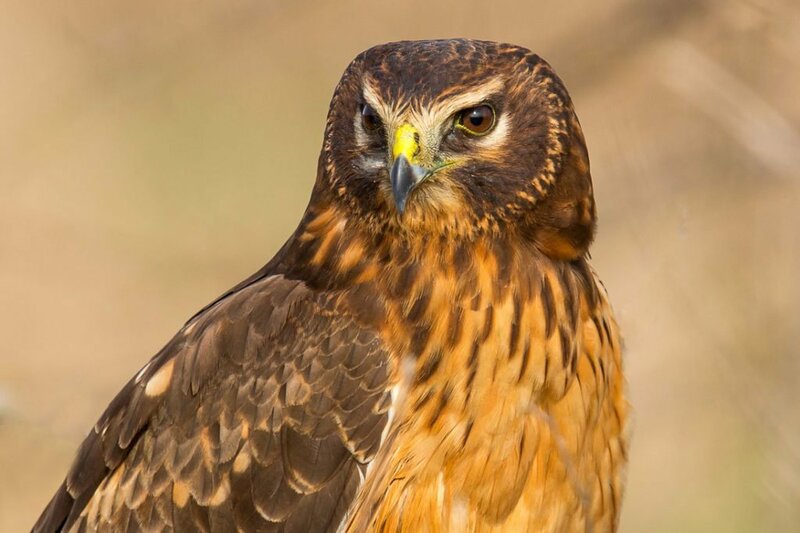 Both owls and Northern Harriers have a parentheses-like mark, or ring, around their face known as a facial disc. Look at the two photos above. You can see that Teasdale sports a black facial disc, while Amelia’s face is enhanced by a white disc. These facial discs are made up of stiff feathers that can be raised to direct sound into their ears. 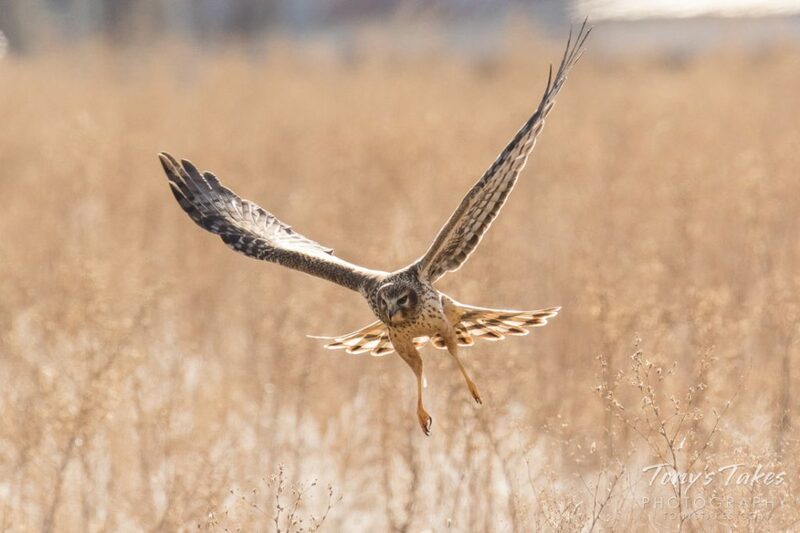 In the photo below, notice the facial disc of a Northern Harrier. Owls and harriers rely on hearing and vision when hunting. With their disc-shaped face directing sound to their ears, they are able to locate prey with hearing alone. 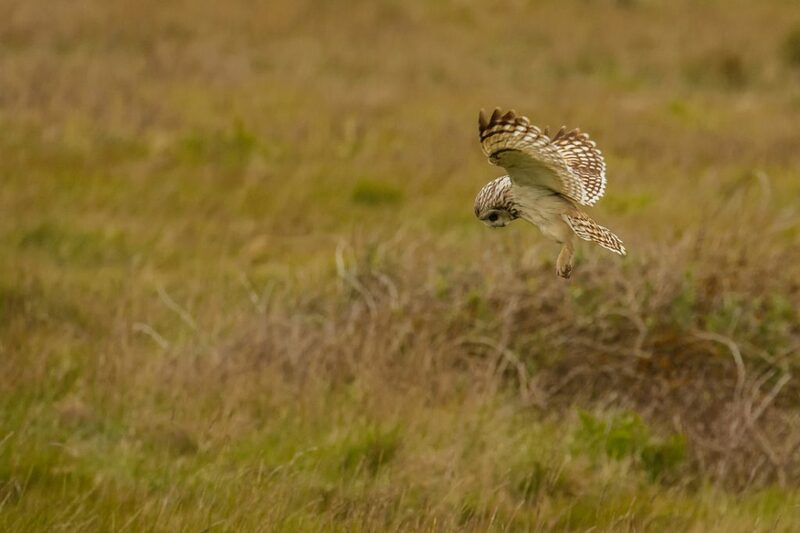 Harriers and many owls can be observed gliding low over open country. Sometimes hovering for a brief moment, they may look and listen for prey moving in the vegetation below. When a potential meal is spotted or heard they will drop down, talons extended, to seize the prey. While many owls are nocturnal, preferring to hunt at night, both Northern Harriers and Short-eared Owls usually hunt during the day. Like owls, harriers are also capable of hunting in low light. Looking through your binoculars, you see a pair of harriers gliding low over the prairie, often teetering from side to side similar to a Turkey Vulture. A flash of a solid white rump band is a distinguishing feature. 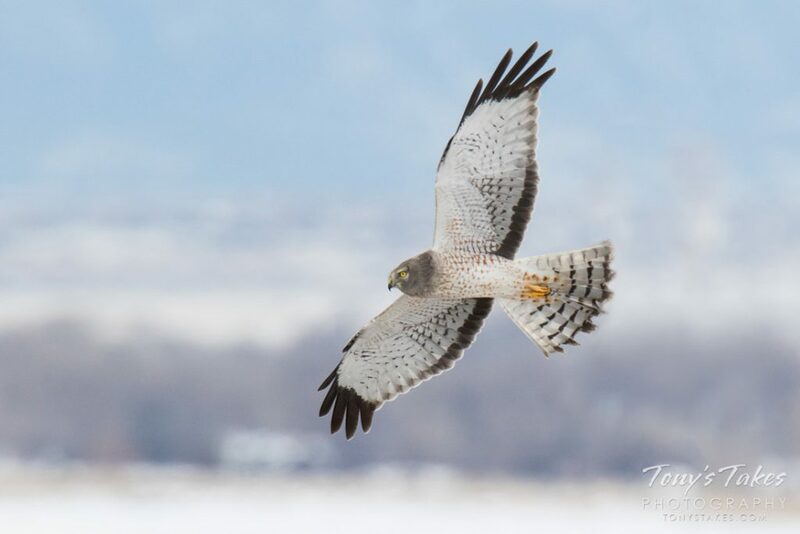 With long yet narrow wings and long tails, their body shape helps to identify the hawk as a Northern Harrier. One harrier is pearl gray above and white below with black wing tips. The other is dark brown above and a washed rufous or buff color with dark streaking below. 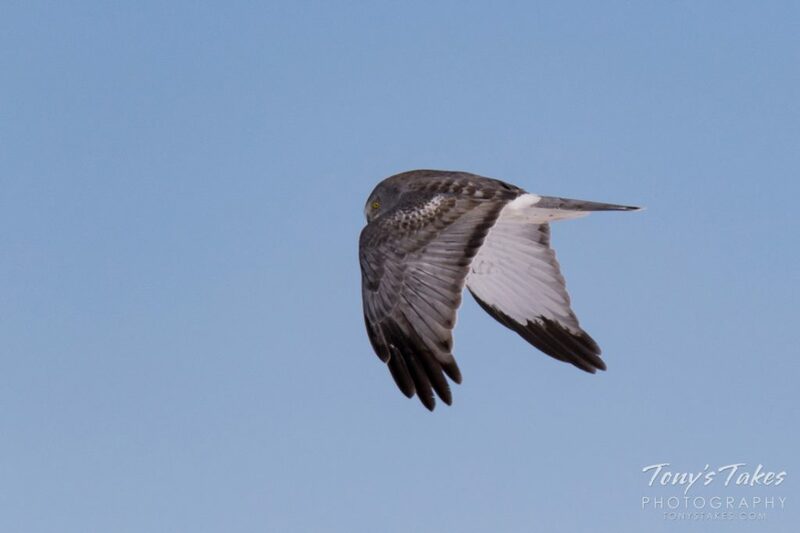 All Northern Harriers have a white rump patch. What does the different plumage color tell us? The white and gray harrier is the male, while the brown and rufous one is the female. Juveniles are often miss-identified as females since young harriers of both sexes are very similar in color to female harriers. Females and juveniles are brown above with brown heads. Juveniles differ with darker rufous or cinnamon underparts and no, or only faint streaking on the chest. Confusing? Sometimes only an expert will know for sure. If you are lucky enough to get a good look at the eyes, the mystery may be solved for you. Juvenile males have pale greenish-yellow eyes, while juvenile females have dark chocolate brown eyes. As adults, both will have a lemon-yellow eye color. Watch this short 2:46 minute video for a close up look at some of the identifying features of Northern Harriers. Harriers nest on the ground. Though males do return to the same territory, they do not reuse a nest, nor do they mate for life. If a male fails to display enough to please the female, or doesn’t provide sufficient food, the female may abandon their mate during courting or nest building. Males may be monogamous or polygamous. Usually the males will have one or two mates. Depending on the resource you read, however, it is believed they may have as many as five to seven. Of the birds living at the Draper Museum Raptor Experience, only the Eastern Screech-owl is sometimes polygamous. Generally, one male pairs with one female. Eastern Screech-owl males, however, may breed with and care for two females. Northern Harriers hunt almost entirely on the wing. Hunting mostly small mammals and birds, they also dine on insects, amphibians, and reptiles. Sometimes they will prey on larger animals such as cottontail rabbits and ducks. Harriers sometimes kill larger animals by drowning them. Small birds may be grabbed right out of the air. Females may weigh as much as 50% more than the males. 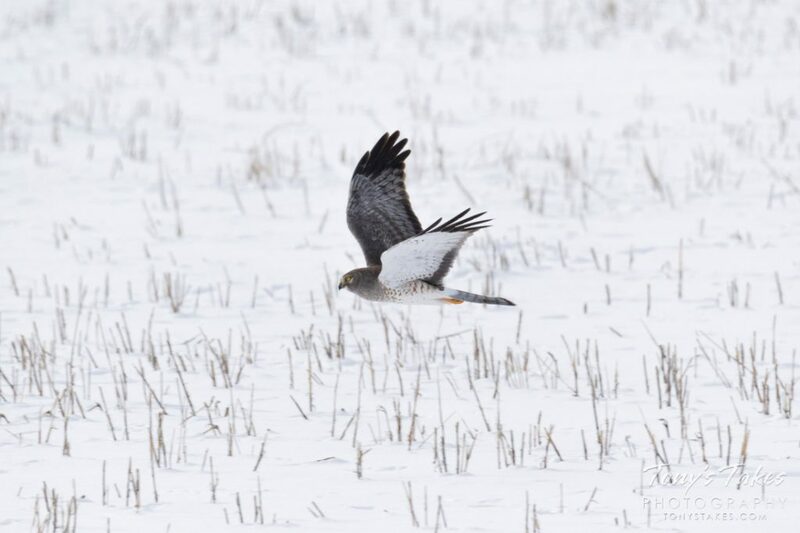 In the winter, Northern Harriers roost communally on the ground, often together with Short-eared Owls. 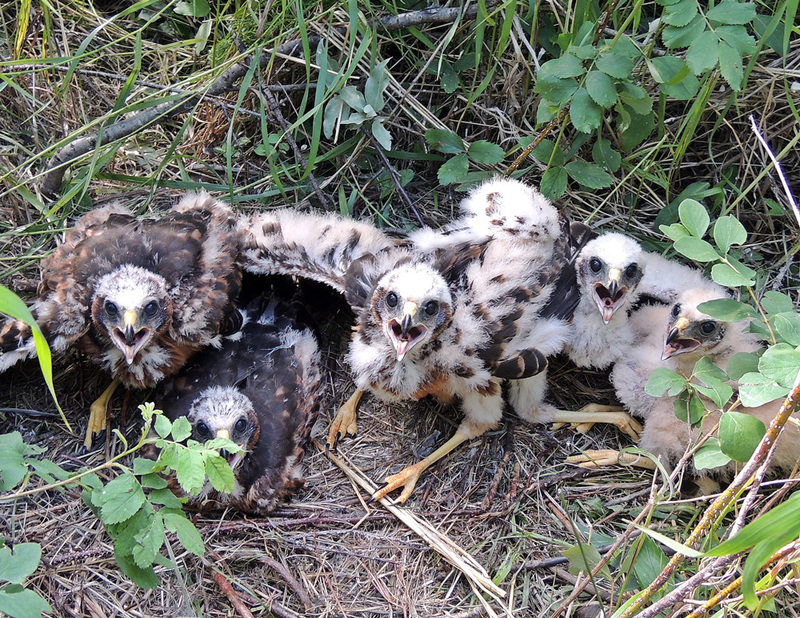 Like Peregrine Falcons, when Northern Harriers consumed prey containing the now outlawed DDT, the pesticide reduced productivity by causing eggshell thinning. 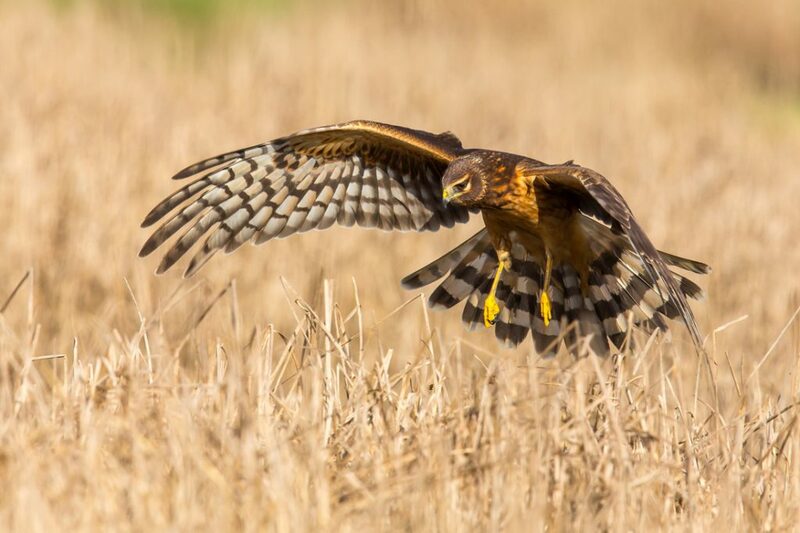 Northern Harrier fossils discovered in northern Mexico have been dated back 11,000 to 40,000 years. Northern Harriers live across most of North America. Ranging from Alaska to Mexico and most of Central America. So keep your eyes peeled and maybe you’ll spot a Gray Ghost or other harrier as it glides over the open countryside.